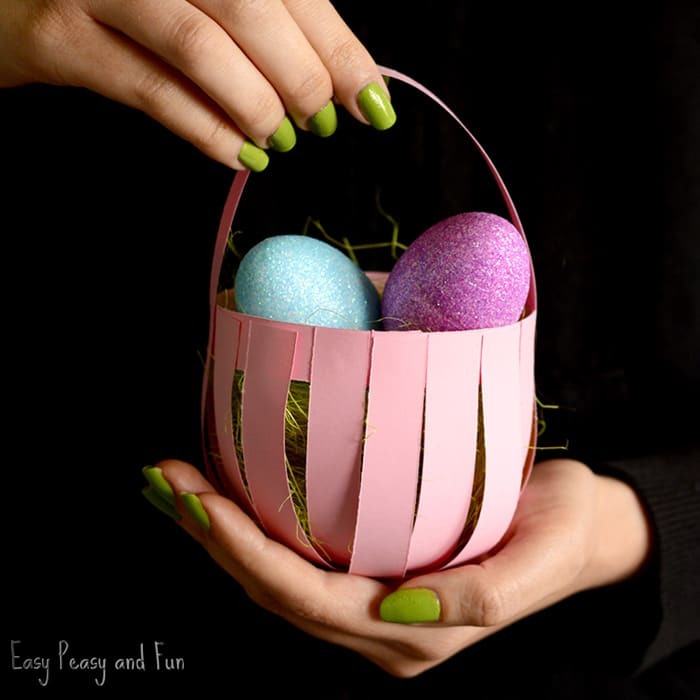 Why not make you very own DIY Easter paper basket craft! 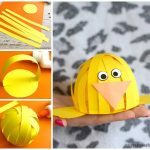 This simple paper craft is perfect for kindergarten classroom, where each kid can make their very own basket. Thinking of setting up an Easter egg hunt with plastic Easter eggs? Why not have the kids make their own baskets first. Kids love Easter egg hunts, and with plastic eggs replacing regular ones, the Easter egg hunt has become even more popular. 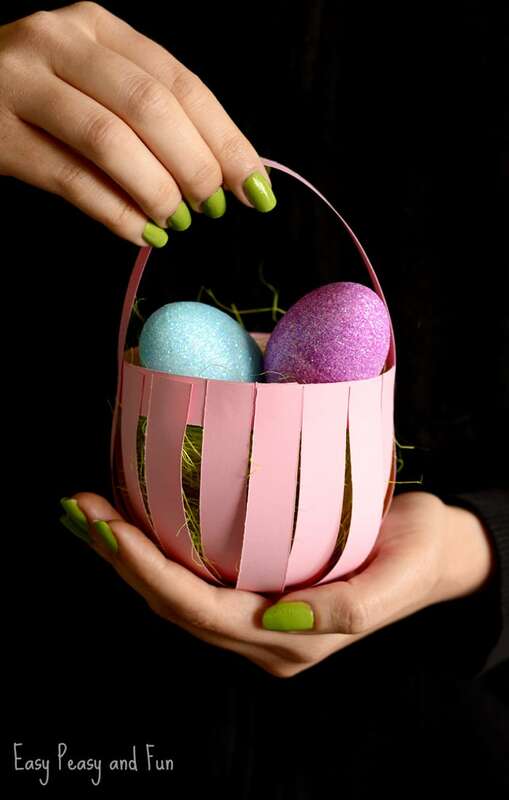 Treats, sweets or little toys (and erasers – totally a hit this year) hidden inside those eggs are true joy bringers. 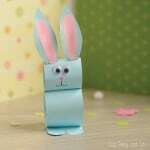 We’ve been busy making simple Easter paper crafts, you can find a whole lot of bunnies, chicks and even sheep on our website so an Easter basked just had to come along at one point. 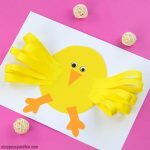 As our simple paper bunnies and chicks were super popular we decided to make the Easter basket craft with the same technique and it really turned out fun and is fairly simple to make! It will hold plastic eggs and other not so heavy objects without any issues. 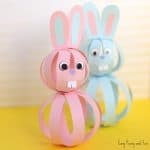 While we absolutely love this one, we do hope we will be sharing a few more Easter basket craft ideas this year, so stay tuned. Ready to make your own? Let’s do it! 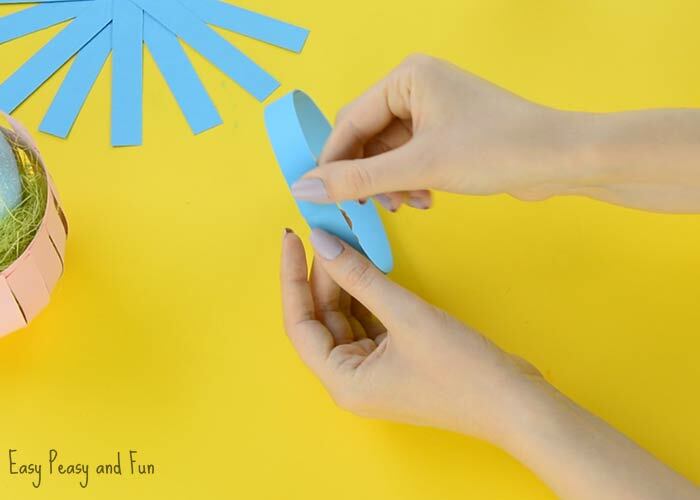 glue (stick glue works great with paper – you could aslo use glue gun – low heat if making this craft with younger kids). 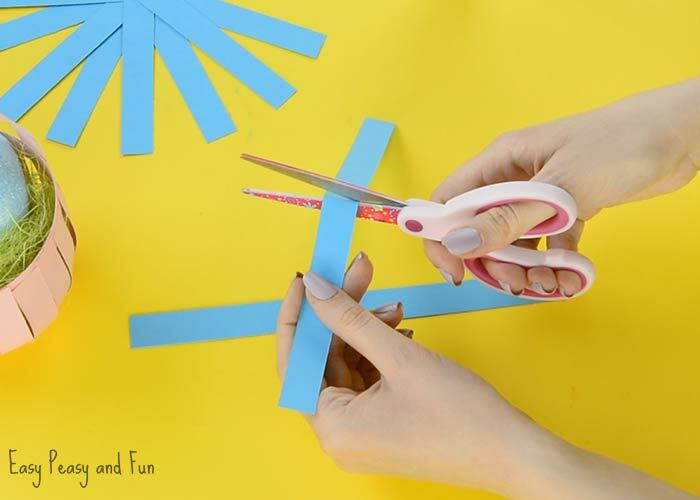 Start by cutting strips of paper. All strips should be about the same width. The number of strips depends a bit on the size of the basket you are making and the width of your strips – the larger the size of the baskets the more you might need and the slimmer the strips the more you might need. We were working with a letter sized (A4) blue construction paper that we were cutting along it’s with. The strips were about 1/2 inch (1,5 cm) wide. 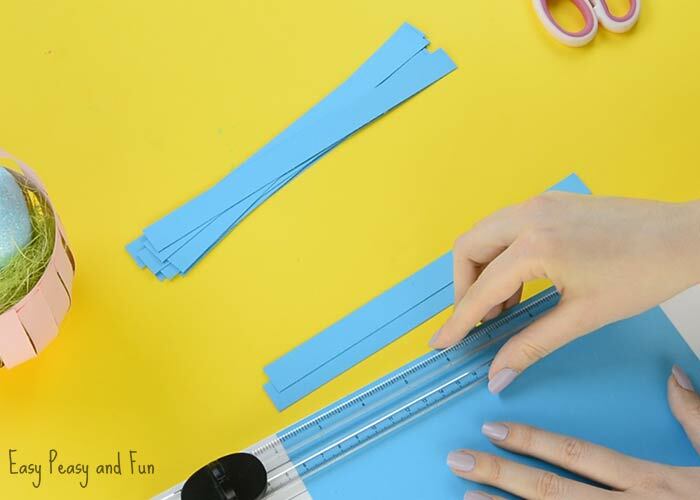 If you are working with this size you will need 8 paper strips for the basket, 2 paper strips for the basket hoop and 1 for the handle – 9 paper strips altogether. 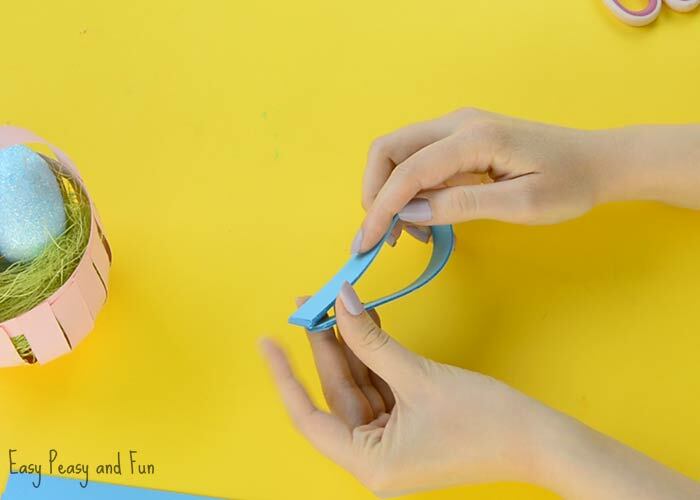 Take the 8 paper strips that you will use for making the basket and gently fold them in half. No need to crease them, this is just to mark the middle of strips which will make the following steps easier. Glue the paper strips one onto another. First glue two of them together to make a cross (glue them in the middle). 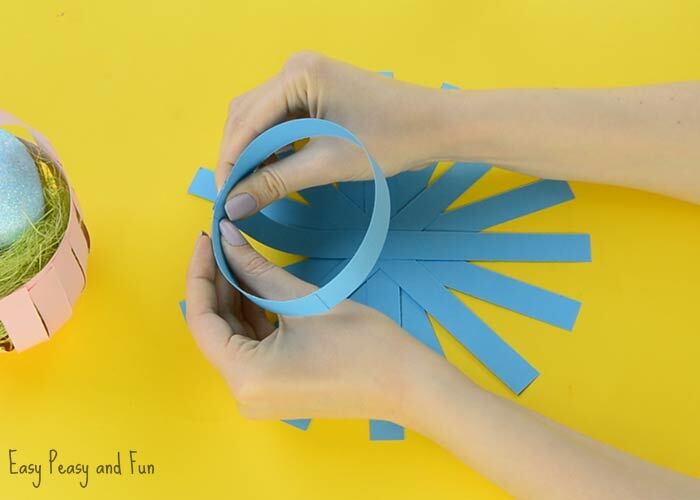 Continue by sticking other strips “in between” making a “snowflake” shape. This will be your basket’s base. Put the base aside and take another strip. Fold it in half and cut it in half. Take another strip and glue it together with the short (the half of the strip you previously cut). This will make a longer strip (paper strip and a half) that we’ll use to make the basket hoop. 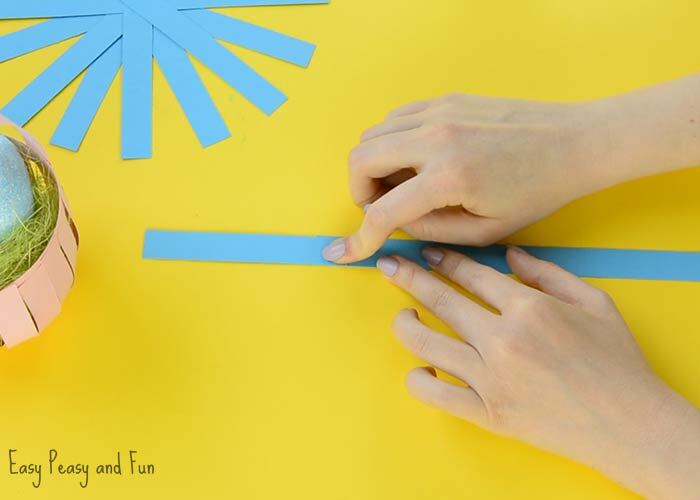 Now make a circle with this long paper strip. Bring back the DIY Easter paper basket base. Add glue at the end of one of the strips and glue on the paper circle. Let the glue dry. Now take the other end of that same paper strip, add glue and glue it onto the circle. You will have to glue all of the basket base paper strips to the hoop. We recommend the next pair of paper strips to glue to be the ones that are at a right angle to the first one (again making the cross). Continue until all of the paper strips are glued to the hoop. This is starting to look like an Easter basket already, all that’s left to do is to add the handle. 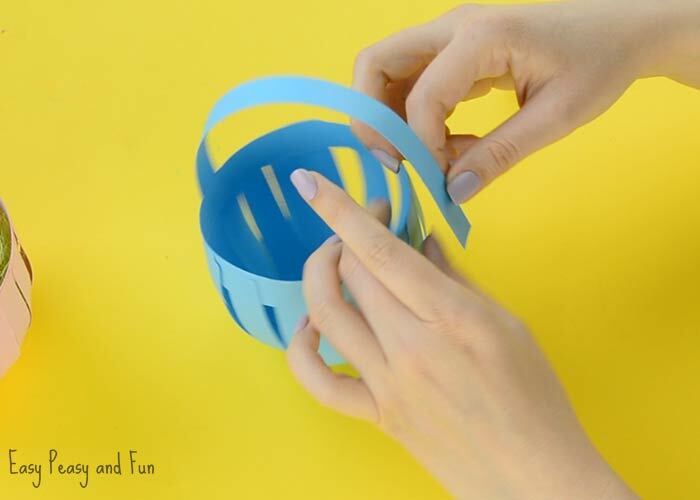 Take the remaining paper strip and stick it to the basket hoop, making a loop. 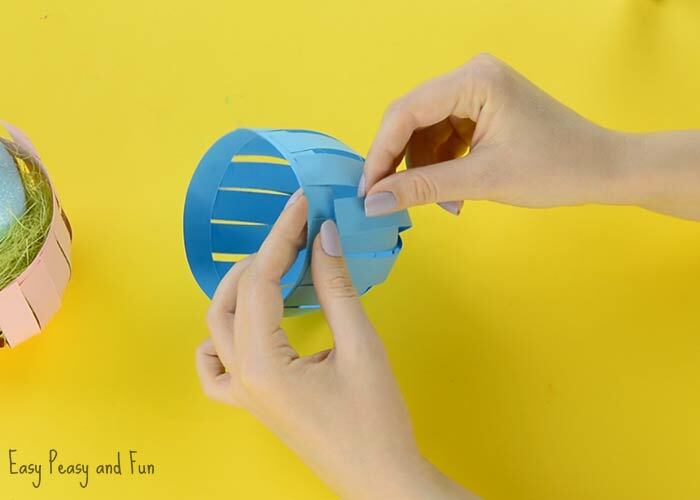 You can even reinforce the basket with another basket hoop – just cut another strip of paper, glue it together with that half of strip that didn’t get used. Glue it all around the basket, on the outside. All done! 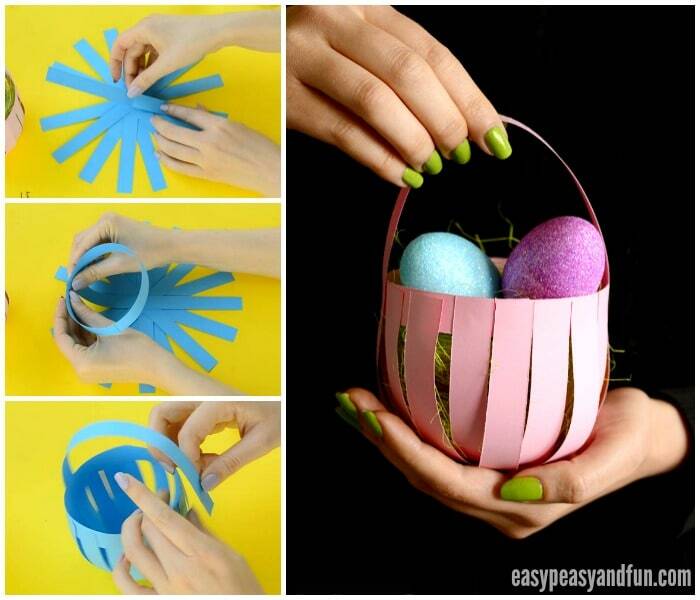 Your DIY Easter Paper Basket Craft is complete! 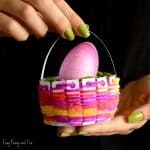 Why Note Decorate your Easter Paper Basket Craft Even More? 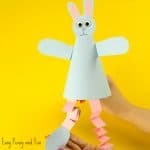 Make paper flowers and stick them on the basked, or a nice colorful bow to stick on the handle or even add some cute paper chicks and bunnies. As with other crafts, some glitter glue will make this paper basket craft all sparkly and nice!